Every Christmas of my childhood, my mother wore a gold bracelet. Engraved on the back is “A.S.P. to B.A.H. Xmas 1913”. This bracelet was a Christmas gift from my grandfather, A. Samuel Prowse, to my grandmother, Bessie A. Hicks, two years before they were married. The rest of the year, the bracelet lived in a velvet box in my mother’s dresser drawer. I always loved opening that box and reading the inscription. As a child in the 1960s and 70s, 1913 seemed like an eternity ago. Now that I’ve been researching ancestors back to the 1760s, 1913 seems so very recent. My maternal grandmother, Bessie Hicks was born on August 31, 1892 in Midgic, Westmorland County, New Brunswick. She was the daughter of Arthur Hicks (52 Ancestors #2) and Morinda Wheaton. Bessie grew up on the family farm in Upper Sackville, the eldest of 8 children. Bessie attended Mount Allison Ladies College (now part of Mount Allison University), where she met her husband-to-be, Sam Prowse. They were married on December 1, 1915 at the home of Bessie’s parents in Sackville, NB. Following their marriage, Bessie and Sam settled in Sam’s home town, Murray Harbour, Prince Edward Island, where Sam was a partner in the family business, Prowse and Sons. Bessie and Sam had 4 daughters: Audrey in 1917, Hazel in 1919, Betty in 1923 and my mother, Florence, in 1930. Albert and Bessie (Hicks) Prowse, with daughters Audrey and Hazel, 1920 Family photo collection. The Great Depression spelled the end for the Prowse family business. In 1932, the family moved to Moncton, New Brunswick to start over. As I side note, I giggled when I saw my mother referred to in that article as “Baby Florence”. The 1930s and 1940s were hard on the family, with little money and their share of difficult times. In 1939, Bessie’s 2nd oldest daughter, Hazel, then age 19, married with 2 children and pregnant with her third, lost her home in a house fire and then lost her husband in a car accident. Bessie and the two younger children moved to Riverside, New Brunswick to support Hazel. They later moved to Sunny Brae, New Brunswick and Bessie raised Hazel’s youngest son. Bessie was widowed in 1949, when her husband died of cancer. Throughout these tragedies, Bessie was always the rock of the family. She made sure there was always food on the table and plenty of love to go around. I’ve always felt a strong connection to my grandmother, even though I never had the chance to know her – she died in January 1965, when I was just 10 months old. My mother has often told me that I remind her of her mother, especially when I laugh. This is my favourite picture of her – she looks like someone who was not afraid to be silly, and I admire that in a person. Bessie (Hicks) Prowse (centre), with her youngest brother Cedric Hicks, his wife Maude, and Bessie’s grandchildren. Abt. 1956. Family photo collection. Great job! Your story really highlights your grandmother’s life with sympathy, backed by facts. I’m inspired to write something similar for one of my ancestors. 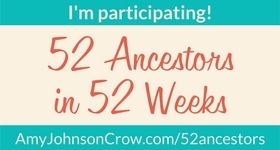 Or you could join the 52 Ancestors in 52 Weeks challenge and write about 52 of them! I started the challenge to get myself writing more. So far, I’m really enjoying it! Thanks for the positive feedback – I really appreciated it.